Plug and play design: everything you need is here! Increase Battery Life and Performance! Average battery life has become shorter as energy requirements have increased. Two phrases I hear most often are “My battery won’t take a charge” and “My battery won’t hold a charge.” Only 30% of batteries sold today reach the 48-month mark. In fact, 80% of all battery failure is related to sulfation buildup. This buildup occurs when the sulfur molecules in the electrolyte (battery acid) become so deeply discharged that they begin to coat the battery’s lead plates. Before long the plates become so coated that the battery dies. The causes of sulfation are numerous. Let me list some for you. Every element known to man has a magnetic moment at a resonant frequency; i.e., a point at which the chemical bonds that hold the molecules together to form a crystal can be broken. Sulfation, the number one cause of early battery failure, is simply crystals of lead sulphate (PbSO4), which have formed on the lead storage plates in a lead-acid type battery. When a battery is improperly charged or allowed to self-discharge as occurs during storage/non- use, these crystals build up on the battery storage plates preventing the battery from ever being fully charged and therefore unable to deliver their full power/capacity. VDC Electronics, Inc. has created a simple method of generating the required resonant frequency (3.26 megahertz pulse) to breakdown the lead sulphate crystals, allowing the molecules to return to the battery’s electrolyte. By creating a waveform with required 3.26 MHz frequency, coupled with a very fast rise time and a high amplitude pulse, more energy is developed to breakdown sulphation than by any other method believed to exist. On February 6, 2001 this unique approach was granted a US Patent. If product is ordered via Air Delivery, a surcharge must be added for oversize package. This is one of the best buys you can make to maintain and recondition battery(s). BatteryMINDer uses a “Smart” Pulse Width Modulated (PWM) solar charge controller-desulfator. This patented technology applies a high frequency pulse circuit that continually desulfates the batteries' storage plates, assuring maximum performance. Keeps batteries fully charged indefinitely without ever overcharging. Includes solar panel, charger controller and battery condition indicator. Rated 4.43/5 Stars from 7 customer reviews. Do you own the SCC015? Please, tell us what you think about it. It helps us provide you with better products. Please note that it may take up to 72 hours for your review to appear. 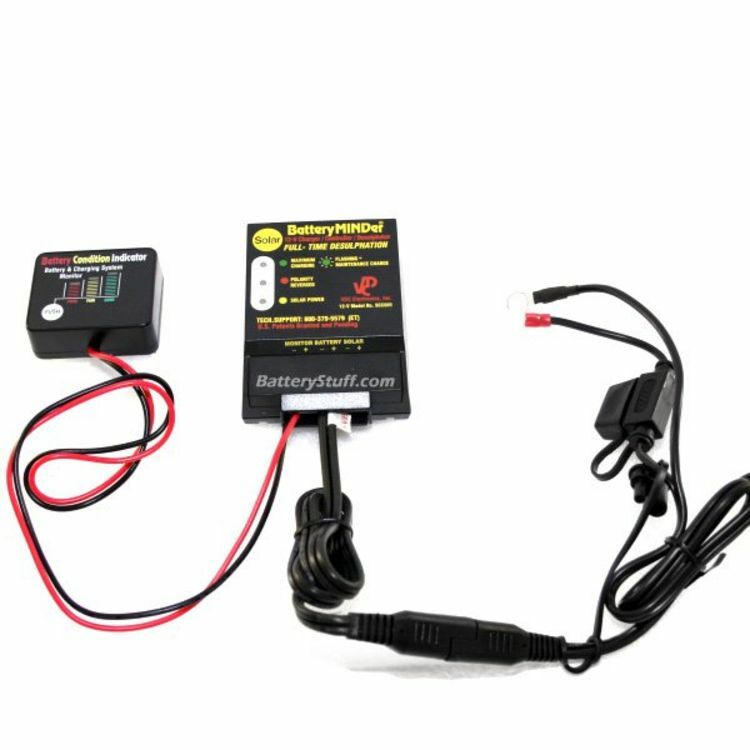 Pros: Installed this on my wife's horse trailer after she complained about not having battery power for her hydraulic jack or other options when not used regularly. Obtained a post mount bracket from another supplier and mounted on 16' wood long post sunk 4 feet into the ground. I put the controller inside a metal box for protection from the elements when driving 70 mph. It's been working perfectly since Jan 2011 and my wife is happy again. I have two, 12 V size 24 dual purpose batteries connected in parallel. I recently added a 800 watt inverter so my wife could have AC power for her motorized hay lift. Cons: I have never seen it go into desulphation mode yet (flashing LED) but maybe that means nothing. Pros: The unit came well packaged and I found it to be well constructed with easy to follow instructions. I purchased as an upgrade to a 5W panel I had tending a deep cycle marine battery connected to a 750W inverter in a 1 car garage / shed I am in the process of converting from nothing to 100% solar. It has gone into maintenance / desulfation mode a few times but I have not had a chance to document actual performance during desulfation. With the included charge controller / tender it is a definite improvement over what I had and a good stepping stone to my eventual goal. Cons: The instructions recommend placing risers under the panel to raise it up to allow air flow for cooling. I used 1/2" PVC pipe cut at 1" lengths inside thin stainless steel tubing for appearance but though that the spacers should have been provided for the price. The battery monitor could use a means to screw mount it in case you don't have a good area to stick the velcro pad. Using a calibrated and certified Fluke meter The output of the panel in full sunlight is 18V @ 750MA which is a tad shy of the advertised 15W if my math is correct. As I continue with my upgrades I will most likely relocate this unit to tend my car and motorcycle batteries. Although it is said that costs are coming down, solar remains very expensive in terms of return on investment. 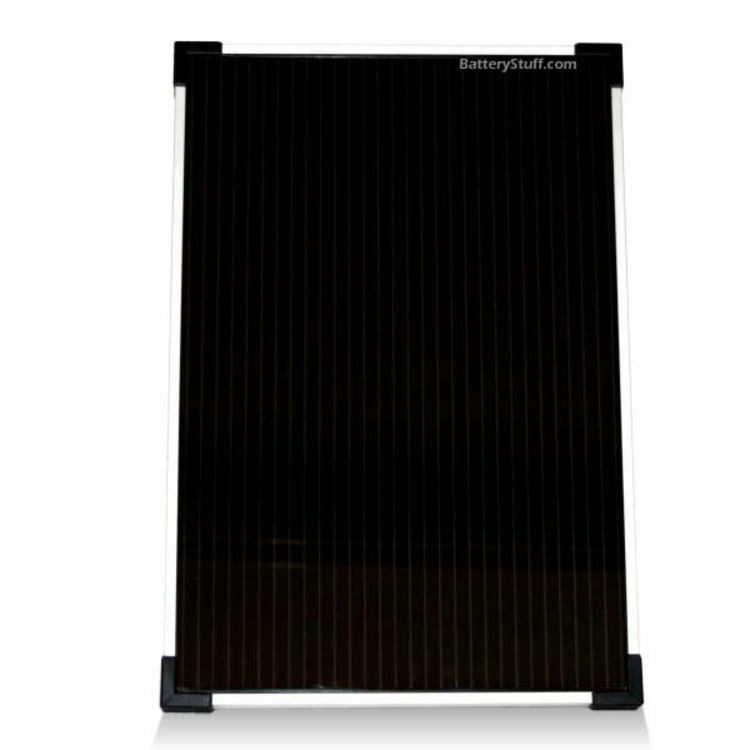 I am very pleased with the product and would recommend it to anyone wanting to build a small solar backup system. As of right now if the power goes out I will be able to make coffee, run a CPF 60W equivilent bulb and listen to the radio or a small stereo through my 750W inverter for as long as I need to. Good supplimental power. It works as advertised so far. It's a start for me, for others it may be all that is needed. Pros: Seems to be well built. Cons: Does not put out 15 watt, even in direct sunlight. It is more like a 10 watt unit. I could only get .79 amps to a battery that was low. I will need more than this to maintain my battery. Pros: I have several different BatteryMinder products and am quite pleased with their performance. Caveat: The battery should be fully charged BEFORE you begin to use the product if at all possible. For those that don't feel it has gone into desulfation mode because it has not reached "float" stage,,,it is always in desulfation mode. The flashing LED only means that it has reached full charge and is in "float" mode. (slightly lower charge voltage so the battery will not lose excess water. Cons: as an engineer, I would like more information in the owners booklet. These products work. I have recovered several batteries with them...but you need to understand their limitations. older batteries will leak internally. If that leakage current exceeds the power of the BatteryMinder you will wait a long time for your product to go into "float" mode as it will be using all it's energy trying to recover the battery...can take a couple weeks. I have a 7 year old car battery that took 3 weeks to "float" the first time, now, almost a year later it will reach float in a couple hours. Pros: Arrived promptly without damage. All components and parts labelled and securely packed. Easy to install for someone with modest skill. Due to security reasons at my storage location I cannot leave the Battery Minder connected continuously. I am able to quickly connect the unit (2 minutes) during visits while I work on other projects. Even in overcast days the lights show the solar is connected and charging, though I have not measured the watts. I also installed a battery disconnect switch to prevent any phantom drain to my Airstream when it is not in use. Battery shows "Good" but have yet to reach "Maintenance Charge" (flashing light). Voltage of my 2 wet cell size 24 batteries tested at full charge prior to installation. Cons: You need a very small screw driver to make the connections. Not a con so much as a notice to have one available.